Justice Minister Ayelet Shaked (New Right) addressed haredi voters, calling on them today to vote for her party. 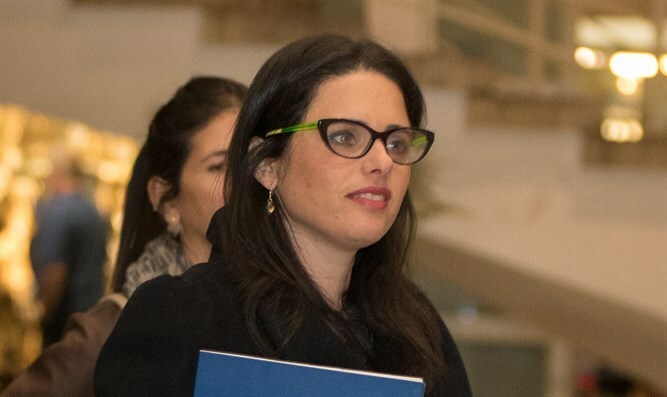 "I see the New Right as a home for working haredim," Shaked said in an interview with the haredi website Kikar Hashabat. "Both Minister Bennett and I invest a great deal in this, and Minister Bennett is fighting - even in academia - to allow for gender separation. We believe that this way we can encourage the haredi community to integrate into the employment market." Shaked related to the Draft Law and statements of Yair Lapid. "I don't buy Yair Lapid's tales when it comes to the Draft Law - this is one big act of populism; you know my position: No coercion will work with haredi society. I recommend not paying attention to the claims of Yair Lapid, certainly not in reference to the Draft Law; it's all one big fluff," she said. Shaked made it clear that an alliance with Lapid would not be repeated. "We proved in the last coalition that we work in partnership with the haredim, that the partnership with Lapid was because Netanyahu didn't want to bring us into the coalition. Today the situation's different," she said. She spoke of the possibility of placing a haredi judge on the Supreme Court. "When I entered office, I saw there were no haredi judges, we appointed haredi judges, Chavi Toker was the first. We shortened the time, the process of judging takes two years, for haredim it takes six months. Anyone who hears me and has been a lawyer for more than five years: Submit applications for judgeship, the judicial system has to represent all sectors. I hope one day will come and I will appoint a haredi judge to the Supreme Court." As for the character of the New Right, she said: "This is a party of religious and secular people, with full partnership, representation, and issues at the heart of the dispute. "It's true that we're something else, we're not about changing beliefs but yes, we're a party that appeals to the entire Israeli public. We tried to bring the Jewish Home secular voters and we didn't succeed. We're running to increase the Right." Shaked is convinced that Jewish Home will pass the threshold. "Jewish Home will pass the threshold beautifully. What I am saying is that the right-wing bloc doesn't have the luxury to take risks. If there are parties that would take 2-3 seats toward the end of the counting but won't pass the threshold, they should join. "We cannot take the risk again as was the case last time, with the adventure of Yachad, Eli Yishai, and Otzma; three Knesset seats were thrown away. All of us have to unite; we're in an election campaign that isn't simple, the Right bloc must be over 61 seats, we have to create unity here."